When it comes to the hip hop music scene, New York City is known for producing greats, however Far Rockaway has yet to be put on the map. Now, local artist Sekenya “Suu” Anderson is looking to change that. 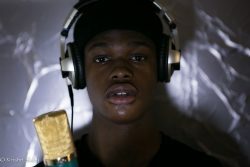 Going by his stage name, Suu is looking to make a difference in the hip hop world, one song at a time. Suu was raised in Far Rockaway and found his passion for music early on. He wrote his first song at age nine and was in the studio recording by age 13. Since then, he’s performed in shows around the city and has even worked with big names in the industry like Grandmaster Melle Mel, Mr. Cheeks, and Sadat X.
Suu’s music relies heavily on his experiences growing up in Far Rockaway. His music centers around his life and his personal trials and tribulations. As for his external influences, Suu is very aware of the talent in Far Rockaway. He calls his community “a place where you can find influences in everything and be an influence on everyone”. He himself has been influenced by slain local artist Chinx, an up and coming Far Rockaway rapper who was killed in May 2015. He also keeps his personal playlist filled with artists he respects. Right now, he’s listening to Don Q, Ro James, Mysonne, and Fabolous. Suu’s music has changed over the years, but he has consistently tried to be truthful to himself and his experiences. He also tries to be a positive force in the industry. In 2015, Suu collaborated with fellow Rockaway artists to create a music video for the Rockaway Youth Task Force. He knows the power that music can have over people and he works to remain truthful and positive. A major shift from his earlier work to now is his tone. He recalls some of his earlier music being “dirtier” than what he puts out now. In his earlier work, he lost his truth and now he’s able to put himself fully into every song. As for what’s next for Suu, he’s excited to continue making music and to make a name for himself. His work in the studio is gaining traction online and he wants to further his craft. To his fans, Suu wants to make sure that his truthfulness shines through to them in his work. He recognizes that being truthful and honest to himself is the driving force behind his work and he encourages his fans to stay true to their own selves as well. At the Rockaway Advocate, we’re proud of Suu and impressed by his work, especially his recent track “Fallen”. But you don’t have to take our word for it. Check out Suu for yourself. His music can be found on SoundCloud at www.soundcloud.com/officialsuu and you can also check out his website at https://officialsuu.bandcamp.com/. Spider-Man Swings to the Silver Screen! Honoring a Hero: Remembering the Life of Manny Fiallo Jr.